1. Crack the eggs into a bowl and beat with a fork until smooth. Stir in the cold diced butter. 2. Season the eggs with salt and freshly ground black pepper. 3. Heat a heavy non-stick frying pan over a high heat and add the oil. When the oil is smoking-hot, pour the eggs quickly into the pan. 4. Using a wooden fork or a spatula and working in a circular motion, move the eggs in the pan around, while at the same time moving the pan back and forth across the heat. Allow the eggs to start coagulating. 5. Stop moving the pan. Allow the eggs to form a light skin, and then remove the pan from the heat. 6. Pick up the pan and tilt the handle upwards and away from you. At the same time, tap the handle of the pan so that the omelette moves towards the opposite end of the pan. 7. Using the side of a fork, fold the omelette in towards the middle on both sides to form a cigar shape. 8. 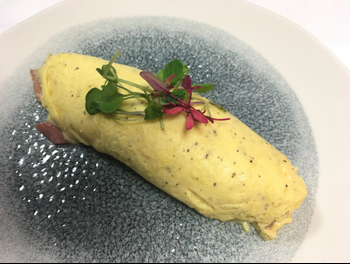 Tip the omelette onto a plate. Serve immediately.